Premium Clinical Grade Kinesio Tape for Muscle and Joint Support. In a reusable tin pack. 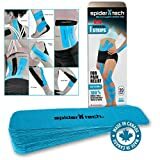 SPIDERTECH Universal I Strips – Innovative Athletic Therapeutic Sports Kinesiology Tape in a sturdy reusable tin pack. ENGINEERED and MANUFACTURED in Canada using premium material – Used for SHIN SPLINTS, PLANTAR FASCIITIS, TENNIS ELBOW, ARTHRITIS, RUNNER’S KNEE, STRAINS and SORENESS among other issues HYPO-ALLERGENIC and Latex-Free to reduce skin irritation and outbreaks EASY TO USE, drug-free, enhances performance, is waterproof and lasts up to 5 days and comes with FREE instructions available inside – it’s so effective you have to experience it to believe it! Use it on your elbow, ankle, knee, back, wrist, shoulder, or anywhere for fast targeted relief Contact us through our website if you need any help.